Arthritis is inflammation of one or more joints, which results in pain, swelling, morning stiffness, swollen joints, tender joints, impacts one’s ability to perform daily activities. It involves the breakdown of cartilage which protects the joint, absorbs shock when pressure is applied to the joint and allows for smooth movement. 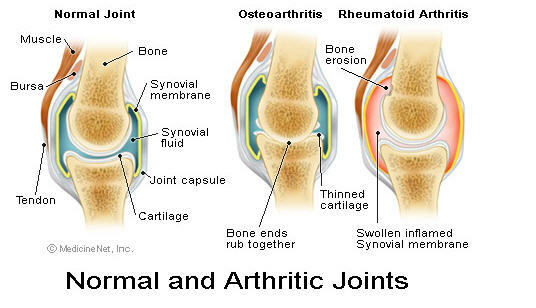 The most well know types of arthritis is osteoporosis and rheumatoid; however, there are over 100 different types of arthritis. I have osteoporosis which is caused by the wear on tear on joints. As the cartilage wears away the bones will rub together resulting in pain or swelling. There are many different types of treatments from over the counter to prescription. There are also injections such as SYNVISC that maybe administered by your doctor. I have tried several different treatments including injections with little success. I heard that honey and cinnamon was good for arthritis so I tried it and had some noticeable success. There is no real cure for arthritis but find what works for you and stick with it.